It looks very much like a house, the formal arrangement of front porch with a symmetrically placed door flanked by windows, the only suggestion of its more honoured position: the seat of Local Government. 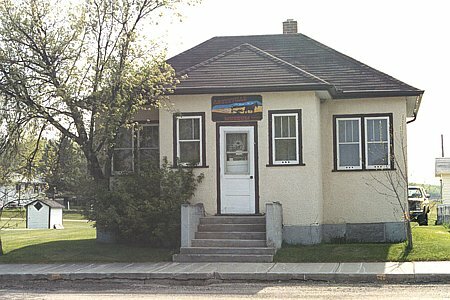 Built in 1938, this was the rural municipality's building, the site of council meetings and offices and also of a vault and jail situated in the basement. The building's official function ceased in 1971, when it was purchased by a credit union. Today the building serves as the Angusville and District Museum.